At this point, we have come to expect fighting games to re-release in new versions. It’s a tradition that started as far back as Street Fighter II and its Super, Turbo, and Hyper editions. 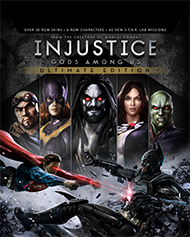 So no one was really surprised when a new version of Injustice: Gods Among Us, called Injustice: Gods Among Us Ultimate Edition, came out not even a year after the game’s original release. If it’s good enough for Marvel vs. Capcom 3, it’s good enough for NetherRealm and the DC Universe. 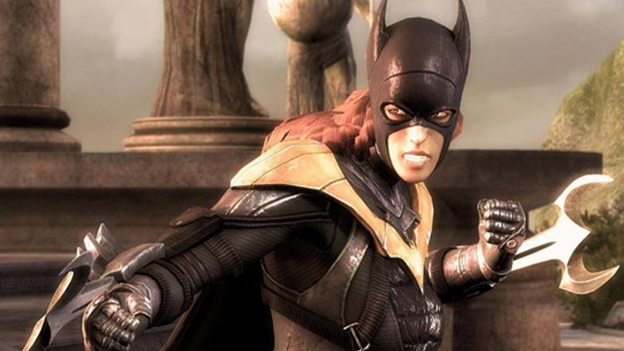 But is Injustice: Gods Among Us Ultimate Edition worth picking up if you’ve already purchased the original? No. No it isn’t. Normally, we go through a huge back and forth comparison of the merits and flaws of the new version compared to the old, but Injustice: Gods Among Us Ultimate Edition really isn’t a new version at all. Instead, it could be more accurately described as Injustice: Gods Among Us “HAH YOU BOUGHT DLC” Edition. Yes, Ultimate Edition is essentially the same game that came out earlier this April, only with all the DLC included. It’s only been three months or so since the last Injustice character, Zatanna, was available for purchase. Now, you can get every additional character, every new costume, and every S.T.A.R. Labs mission for the same price as the full game when it originally released. Needless to say, this is bound to piss off people who paid nearly $120 to stay current with the game’s DLC as it came out. There are some people who this version of the game will appeal to. Anyone who purchased the original version without picking up any DLC is getting a decent deal here. It’s not that much better than picking up the DLC piecemeal, but it’s something. In addition, Ultimate Edition marks the first time the game appears on PC and PS Vita platforms. The PC platform version is probably the biggest reason to get Ultimate Edition, as it has entirely re-worked netcode, which will be huge for people who take their online matches seriously. The PS Vita version is OK and falls in line with what you have come to expect from Vita fighting games. The graphics are fine, and the game responds well. It’s essentially identical to the console version. The only difference is that the Vita version comes with touch-screen controls, but these are really more of a gimmick than a reliable way to play the game. Ultimate Edition will also be available on the PS4, and we will cover that when the console launches, but the only notable differences that have been advertised are a graphics overhaul and touch-pad controls, and once again, touch controls for fighting games just aren’t reliable. The DLC characters are pretty cool though, and if you haven’t checked them out, they are worth a look. Batgirl is a pure rushdown character. She has a lot of aerial moves and ways to control her on-screen position. Her superhero trait allows her to control whether or not she does more damage on hit or block, which allows her to absolutely wreck turtlers. The only real way to reliably beat Batgirl is to get in and do damage before she does the same to you. Lobo Is more of a straightforward bruiser character. While he does have a shotgun and chains, these aren’t used to deal damage as much as they are used to get in and start combos. He can also dodge projectiles with his dash, which makes getting in on zoners a little bit easier. His superhero trait loads nuclear shells into his shotgun, increasing the power of moves that utilize it. That being said, his shotgun moves are kind of scattered throughout his move-list, so it’s kind of a catch-all “load a shell if you can” ability. Zod was considered very powerful when he first released. His superhero trait allows him to call on a wraith from the phantom zone. 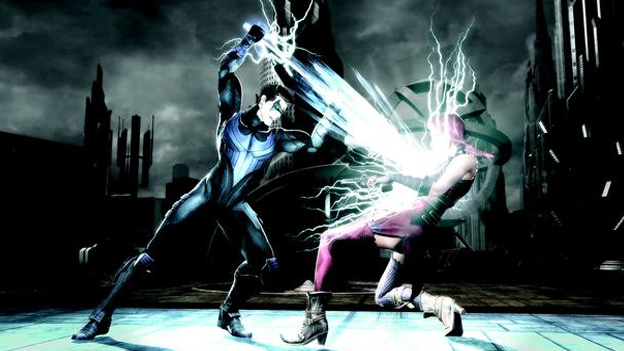 The wraith stays behind the opponent and attacks when Zod commands it to. This allows Zod to set up sandwich combos, which deal a ton of damage. He’s not quite a traditional shadow character, as you can’t move the wraith independently of yourself, but he’s certainly a good introduction to the playstyle. The Martian Manhunter has the ability to stretch his limbs into different forms, but only when his superhero trait is active. This allows him to set up combo opportunities that he may not have had originally due to the increased hit-boxes of his attacks. He can also insert this ability in the middle of combos as a sort of makeshift cancel.